A few years ago, I prepared a possible CD release based on a cassette copy of the album demo I got from the composer. This of course was very “hissy” and contained a more than fair amount of rumble, with some tracks only in mono. Nevertheless, my obsession with this score led me to spend a good dealing of studio time trying to make the music from this format as listenable as possible since the original tapes had seemingly been “lost” when Olympic Studios was shamefully closed. For this first possible release I initially received encouragement from the publishers, Sony/ATV Music … then silence. Nevertheless, I still had hope, with the encouragement of Stephen’s brother Jim, of bringing this project to fruition. Jim was also able to provide a cassette copy of all the scores cues … but these were in worse shape than the album demo and would prove impossible to “clean up” to a listenable state. I then approached an American label who had a good relationship with Paramount about seeing if some of the tapes had ended up in Paramount’s vaults. Gold was struck immediately as various tapes were found in storage. Then came a disappointment from the American specialist label: they decided to pass on releasing Lady Jane. “Given the flooded market, we’re trying to decide if it’s just a bit too risky. The composer doesn’t have much of a following and the title is a bit obscure. It’s a bit of a quandary.” And I totally respect their view because having my own label I realise how saturated the soundtrack market has become. But I was not too disheartened as I then approached my good friend Jose Benitez at Quartet Records, with whom I had worked on CD editions of Shout at the Devil and A Passage to India, and he manfully took up the baton and swiftly was able to get the tapes held by Paramount transferred to digital format. I was in heaven when I received the hard drive! But on closer inspection, I found that over the years the tapes had suffered and certainly the ones that contained the album and demo mixes were full of dropouts and errors. Luckily, the two tapes of all the raw cues had fared better but not without their own problems…so it is from this source that I was able to recreate not only the complete film score in sequence (minus a couple of solo percussion cues), but also recreate the album mixes from the demo that Stephen gave me all those years ago. Thanks must go to the mastering genius of Gareth Williams for sorting through all this material with me to find the optimum versions of each cue. There is still a certain amount of tape hiss and extraneous noises as well as occasional distortion present but Gareth has reduced these elements to the absolute minimum without detracting from the overall quality of the original session recordings. 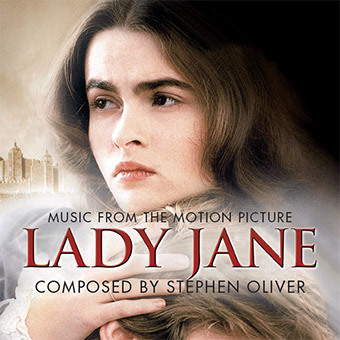 So, at last ­– after first hearing this music over 30 years ago – I have finally been able to produce a CD and share Lady Jane with the world.